Such a sweet, tart, creamy discovery. It wasn’t until my late twenties when I came upon this little treasure of simple goodness, and I will never look back. Brian and I had just finished dinner, and we were talking dessert, checking out what we could make from what was in the fridge. He saw the raspberries, and said the words… milk, sugar, and raspberries. I looked puzzled, I am sure of that one. He reassured me that it is one of the best treats, snacks, breakfast, whatever you want to call it, but it is good. He grew up In Washington on a farm covered in berry bushes, so walking around with his dog picking berries was not unusual. I had to trust him on this, because in Mexico where I am from, or really even where I grew up in Sacramento, I have never heard of such a dish. So I trusted, and I tried, and I am happy I did. It is just sweet enough to call it dessert, light, and healthier than a bowl of ice cream. I have since then tried it with strawberries, and blackberries, and I think the raspberries are my favorite. And in our new home we have just discovered a large raspberry bush growing thanks to our neighbors who planted on the fence on their side and it has overgrown to our side yard. It does not bother me one bit, I thanked them for it instead. So last night we gathered our berries and treated ourselves to a sweet delight. Grab a handful of berries, or as many as you would like. 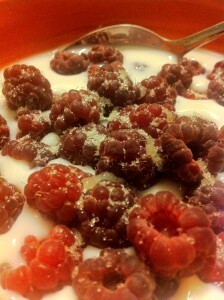 Place in bowl, cover with milk, and dash as much or as little sugar as you like. I have mentioned before, but will say again, and again. I use organic pure can sugar, not white processed sugar. It is not as sweet, but better for you, and delicious.